In this clip of the Armstrong-Oprah Winfrey interview, Lance displays a great example of a cluster of anger. Freeze the video at 0:47. 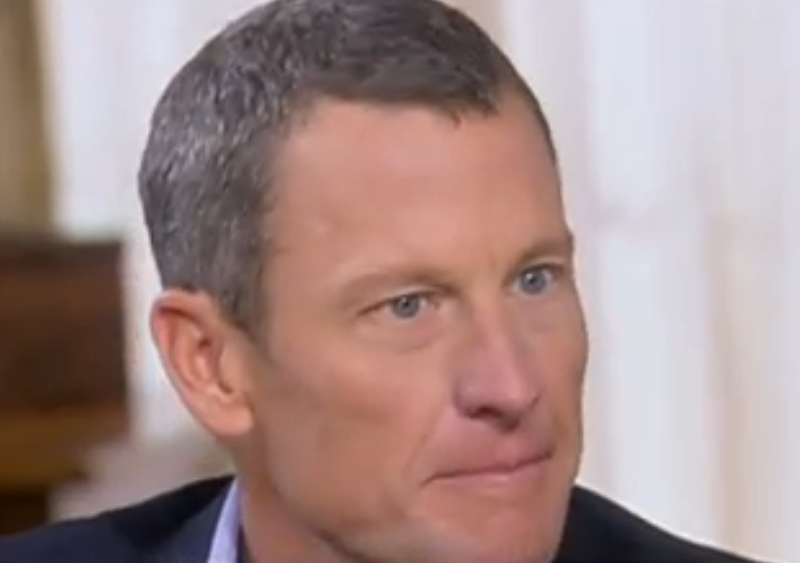 Note how Armstrong's lips stretch horizontally and grow very thin (particularly his upper lip). Alone, this nonverbal is highly consistent with anger. This body language co-exists with significant tightening of the disgraced athlete's mid-face and a dilation of both nostrils - both also correlative with anger. In addition, Armstrong's eyelids are opened significantly wider than normal. In the context of the above mentioned facial displays, this amount of eyelid nonverbal is diagnostic of a moderately elevated level of anger. Armstrong is an example of what Paul Ekman has termed a "Natural Actor". In short, he is a very good liar. He had most of the World duped. At the 1:38 mark Armstrong says, "....I'm not the most believable guy in the World right now, I understand, but [then he takes deep breath] I did not do that", in reference to bullying and threatening others to use performance enhancing drugs. This is what is known, as couching a "truth within a lie" - he tells us a truth that we believe ("....I'm not the most believable guy in the World right now, I understand, but I did not do that ...") then he tells a lie ("...but I did not do that"). When the lie is buried within a truth, we are more likely to believe the liar. At the 1:45 mark he once again adopts the "thinned lips of anger and eyelids open wide of anger." And although not definitive, within the context of this massive mia culpa and his truth within a lie - this anger display is also suggestive of deception. Note also he inhales deeply an instant prior to saying, "... I did not do that". This deep inhalation at this specific time is strongly suggestive of anxiety-deception. A person telling the truth would not have to pause for breathe here. Then he stares directly at Oprah (we cannot be sure because she is not in this camera view, but very probably in her eyes). When in the midst of defending a lie, eye contact either goes WAY up (e.g., staring into one eye or switching between eyes) or drops off significantly during moment of the lie. Lance stared at Oprah. All of this indicates than Armstrong was lying about threatening his team mates. Armstrong did not come fully clean.